Osama and Gandhi are both from well to do families and grew up showing no signs of becoming what they would become eventually. The roots of their transformation lie in the rejection they faced in their early adult life. 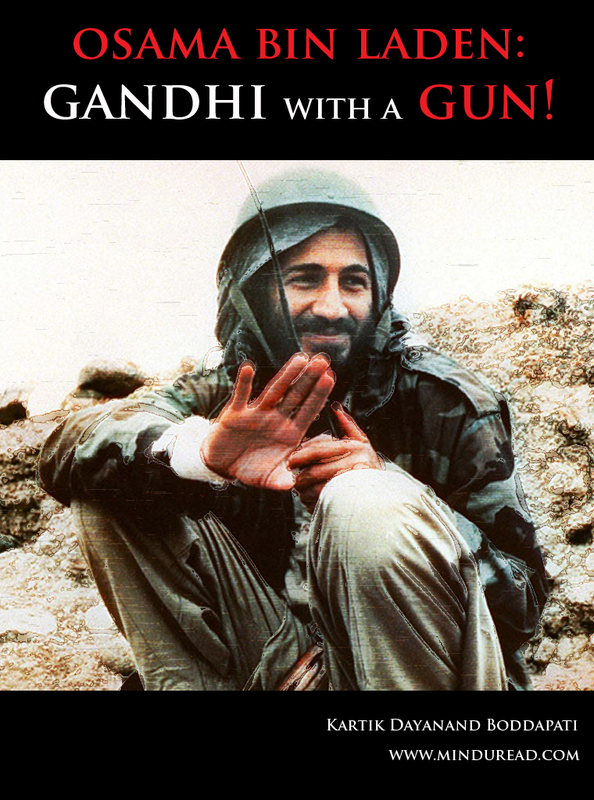 If Gandhi was thrown out of a railway compartment in South Africa because he was coloured then Osama was treated with little respect by the country of his birth due to his affiliation with the Afghans that he had because of religious sentiments and the financial support he provided to repel the Soviets. Gandhi faced further rejection and discrimination before he moved to India to take up his movement against the British while Osama was literally thrown out of his own country and then a few other countries as well which led him to become increasingly mad at the western world, namely the USA which he believed was holding the reigns of these nations as puppeteers would do. Mahatma Gandhi wanted the British to leave India and Osama wanted the US to leave the Arab world alone! The motives for their respective movements are very similar, to overthrow the repressive regimes that were ruling them or ruled them by proxy. Let’s now look at the methods they employed to propel their movements. Ahimsa or non violence became the primary weapon of choice for Gandhi which the British hardly knew how to counter. If they slapped him on one cheek he offered them the other. In stark contrast to this, Osama chose to pick a gun and terrorise them. Their impact was the same but the methods varied and the end results also speak a different story. Mahatma Gandhi would be no different from Osama if he had chosen to pick a gun instead of showing his cheek! But how did they manage to influence such large numbers of people to their style of thinking? None of them had the support of the state nor were they dictators like an Adolf Hitler or a Saddam Hussein who ruled countries. Yet, the support they generated is beyond comparison to what any normal political leader would garner even after spending millions of dollars of tax payers money. Osama and Gandhi are both leaders who had unflinching faith in their vision to oust the outsiders be it through violence or non-violence. Much of India was suppressed excessively by the British so it left the people little option but to join Gandhi in his protests as it showed results. Osama did the same through violence as he had seen that it worked in earlier instances where the US retreated when it was under threat in Beirut and Somalia giving roots to his cause of Jihad that his followers lapped up instantly. They are not just two ordinary people who got lucky but two people with extraordinary ideas and what reinforces their following is the fact that it might be easy to kill them but their ideas once planted are almost impossible to root out. The famous dialogue from the Ram Gopal Varma movie 'Sarkar' holds spectacularly true in their context. Before killing the man it is important to kill his idea. Sadly the Americans don’t seem to realise this point in their war against terror. This brings me to the second part of my post where I would like to talk a bit about the act of war. Origins of war and the survival of the fittest! Terrorism and war are not a new phenomenon to this world and existed since pre historic times. Charles Darwin’s concept of ‘Survival of the fittest’ in his 'Origin of Species' is nothing but reiterating the fact that only the winners survive to tell the story, the rest are history or maybe not even history. Before civilisation or society came into existence everything in this world was a fight for survival. Right from food to mates to shelter, ever single conceivable necessity was fulfilled by engaging in acts of violence. For thousands of years man has been accustomed to it and over a period of time developed something called as a society to structure his life. It is because of the structure in our society that we today live a civilised life and not fight for our daily needs. War is a natural state of being! Peace is a structured state of existence. Peace needs maintenance in the form of an army. The moment this structure is tampered with, the seeds of terrorism germinate. There would be no terrorism in this world if every man got what he wanted. But man is a greedy animal and god also did not create everyone as equals. So there will be strife and struggle and war is nothing but an advanced state of terrorism engaged by nations with an agenda. Ok, did I hear someone say OIL? 9/11 vs The war on Terror! It is ghastly for all of us to see the 9/11 deaths but we hardly ever hear many stories of the 1000’s that died in the war that ensued after the event. There are some fascinating articles and one among them I would like to share here ‘A Just Cause, Not a Just War’ by Howard Zinn. It is remarkable to note what he has written 10 years ago right after the 9/11 event at the start of the war against terror. He speaks of the horrors of war, collateral damage that is caused by destroying the fabric of society by targeting public utility services like power and water plants, etc. The amount of innocent people that die indirectly in war is far greater than the ones who get killed in regular terrorist attacks elsewhere. Also check out this Photo Blog from Steve McCurry for some eye openers. The greatest form of terrorism in this world is WAR! After seeing the way Osama was wiped out in front of his family members which includes little children it won’t be surprising to see them take the gun just the way their father had and with complete conviction and justification. Because revenge is something that can blind anyone and sees no innocents. Whoever said all is fair in love and war certainly knew a thing or two about the nature of war! I asked this question on my Facebook Page the day I heard that Osama’s 12 year old child saw him getting killed... “Did you know that Osama's 12 year old daughter was present when he was killed in the raid? Do you think the US govt could have handled the situation better?” The very next day even Time Magazine asked the same question on their Facebook Page. USA has given an EQUAL and EXACT reaction to Osama rather than giving the opposite reaction! Instead of spending trillions of dollars in war in the name of weeding out the terrorists it would have been best had the US invested that money in rebuilding the fabric of the very society that they are knowingly or unknowingly destroying, same applies to every government that is waging a war today. Once this is done, no man would ever have to pick a gun again or show his other cheek.